Shop NCAA, NFL, MLB, NBA, & more! Fanatics.com has a huge selection featuring football jerseys, t-shirts, and hats to name a few. Over 600 teams available for every fan. 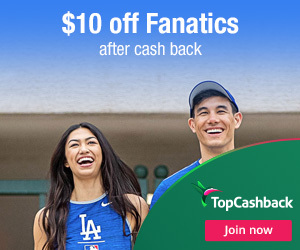 Through December 31, 2019 purchase any item(s) that totals to $10.00 (excluding sales tax and shipping) at Fanatics and get $10 back. To take advantage of this offer, simply join TopCashBack thru our link. Once signed up, you'll be redirected to the Fanatics offer page. Add $10 or more to your cart and checkout. Within 14 days, you'll be credited with $10 in cash back!